Windy City Ribfest at Lawrence and Broadway with Berlin (from Top Gun fame) as performers - volunteers are still needed and you can sign up at this link! And the same day, the Sheridan Park Arts Festival! Our Call to Artists is still out: sign up for a booth or as a performer! You'd rather feed the crowd with your cooking? We also have slots for food vendors. More information at the link and in the attachment. And as always, our BYOB Game night every second Wednesday of the month at Emerald City Coffee. Last but not least, Sheridan Park Neighbors Association has recently welcomed a great group of volunteers and we're now looking at making this official and incorporate. So please join us on June 6 at 7pm at Emerald City Coffee for an extraordinary meeting where we will elect our officers. That will allow us to be more ambitious for our various events and initiatives! We will file for incorporation shortly thereafter. 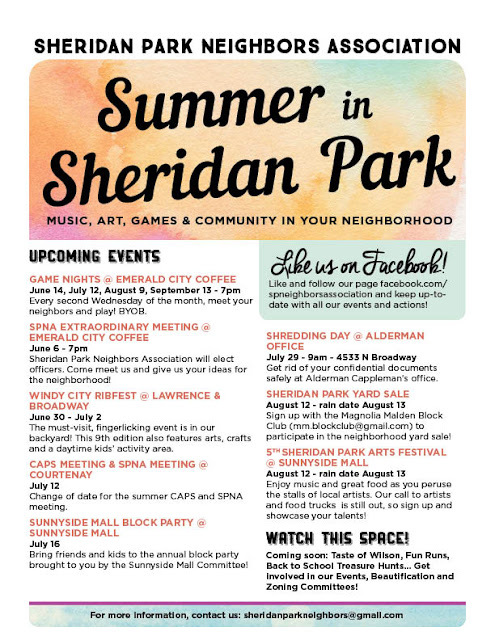 We're looking forward to seeing you this summer in Sheridan Park!